In Egg Breaker Adventures we combined the high score, prize winning, mega multiplier fun of the original Egg Breaker with the adventures of Egg Breaker 2 to make what is definitely the awesomest Egg Breaker game yet! Monkeys. So many monkeys to choose from. All dressed up in awesome ways. Monthly themed events such as Xmas, Halloween, Easter, and many more! Dress your monkey with stylish hats! Stack them up real high and get super bonuses. Test your mettle with Challenges. Finish them before the time's up for special prizes. Chat with Erika about EBA! Thank you for bearing with us during the growing pains of releasing Crusaders. As it was an unexpectedly a massive success which created many chat rooms and communities to keep track of, our community management efforts have been strained. We realise that part of your enjoyment of Egg Breaker is seeing us at Codename in chat and we know that this hasn't been happening as much as we would like. So, we're going to try something new. Instead of Erika spending time in chat at unannounced points throughout the week, we'll schedule a specific time each week for her to spend an hour in Facebook chat for Egg Breaker Adventures, answering your questions directly (assuming the information is available, of course). This way the community will know exactly when they can connect with Erika in chat. If you can't be online to talk to her live during those times, you can still always post questions and suggestions on the Codename forums, and request technical support through the ticket system, as usual. Starting the week of April 12th, Erika will be in Facebook chat for Egg Breaker Adventures every Thursday, 11 am - Noon Pacific Time. Tags: new content, eba, event. It's time to give thanks for all things. And what says "Thank you for being in my life" better than a nice meal? The Pilgrim Monkey is on hand to ensure that the bounty of the fall is harvested, to prepare an epic feast for all the monkeys to enjoy. Help him prepare the Thanksgiving meal by decorating the table and filling it with delicious food stuffs. Collect wild turkeys to earn trophy room decorations, complete the Challenge Egg challenges for sweet delights, or check out the available Extras in the Pilgrim Monkey's store! - Collect 18 different types of supplies to prepare for a feast, in ever increasing amounts. …12 preparation items at the Gold stage, as well as having won all 12 prizes to earn the Thanksgiving Event Trophy! If you merely activate the monkey, but do not feed him, the buff will not increase. You must feed the Pilgrim Monkey for the buff to increase. The permanent Base x2 buff only applies to preparation item wins. The graphic for the buff itself will not change, by placing your cursor over the buff icon on the right side of the breaking screen, you can see your buff has leveled up to. All normal buffs are available. The base multiplier will reset every day at Midnight PST. Visually watch the feast table become crowded with tasty goodness! Keep count of your Wild Turkey Achievement progression! Easily track your progress towards preparation completed, Prizes collected (Click the Prize button to see which ones you've earned/are missing), Progression Ribbons and the Thanksgiving Trophy! Trophy: Can be displayed in a Trophy Room. 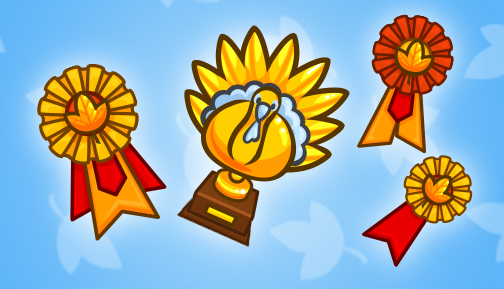 Ribbon and Trophy (if earned) are awarded after the event finishes on November 27, 2015. The highest ribbon earned will be awarded. As you break eggs, wild turkeys appear and wander around the screen. Gently tap the turkey before it's gone! The turkey will try to escape, but one painless tap and magically you have a fragrant, perfectly cooked turkey! At the 1st, 50th and 250th turkey found, you will unlock special decorations for your trophy room. Turkeys will continue to appear after you have earned the last achievement, but you can continue to hit them. - Must be used by 11:59:59 PM PST on 2015-11-28! New for 2015: Turkey Neck Hammer: Less Nothings! 2014 Chef's Hat: Chance your last Egg Broken was free and 10% more Gold! 2014 Football Helmet: Small chance of a bonus Hammer win and 10% more Event Tokens! The Thanksgiving Event will run until Friday November 27th @ Noon PST. Post comments and questions on the forums! It's Time for Some Intrigue in EBA! Tags: new content, event, eba. The names Kong....George Kong. A debonair and dashing monkey with superb skills and a knack for getting in, and out, of trouble. This handsome primate is the Challenge Fairy's favourite movie spy, so she's put together the all-new Agent 009 Burst Event to celebrate everything about him! For the duration of the event, special challenge eggs will temporarily replace all normal challenge eggs, and the eggs will appear at a higher than usual rate. Players can earn 12 event prizes of various Spy themed items from cashing in Event Tokens with the Challenge Fairy Monkey. For the toughest of tough challenges, there are 3 awesome prizes! The Spy Trillby adds more Multipliers! The Golden Gun Hammer adds more Multipliers! The Martini Set makes any trophy room ready for a visit from Agent 009! The event will run until Wednesday, November 11th at Noon PST! Tags: eba, community, volunteer mods. Love Egg Breaker Adventures? Hang out in chat? Then consider becoming a Volunteer Chat mod! If you would like to become a moderator, help the community, and make a difference in people's lives, you are in the right place! An account that has been active for 6 or more months. Active community participation (forum posts, chat, etc.) of helpful and considerate nature. No history of account abuse. You DO NOT need to be an expert on our games, or finished available content to be considered for a Moderation position. Must move quickly, and be able to respond in short, succinct phrasing to answer a player's question. Must not only be able to keep up with the conversation, but be attentive to multiple conversation threads at once - getting players to stop chatting for even a moment is nearly impossible. Must anticipate how their tone will be received - you cannot edit what you say in chat, once it is out there, players will NOT hesitate to copy and paste your exact answers back to you, to take out of context what you say. Must assume every question in chat is asked legitimately. Sarcasm in chat is never received the way it's intended. Drop it from your vocabulary entirely (no matter how SORELY you are tempted), and you'll miss less questions that way. This is what you will need to know to successfully complete an application and increase your chances of becoming a moderator in one of our games. Do NOT email us asking to be a mod if there are no openings listed. Do NOT send multiple emails requesting to be a moderator. Do NOT start a forum thread about why you should be a moderator. Do NOT spam or promote inappropriate behaviour if your application is denied. DO continue to work on your interpersonal skills and show maturity within the community. Grow your account and your in-game persona regardless if your application is accepted or denied. Please complete the entire form and be as honest as possible. If we choose to proceed with your application, you will be contacted via email with further instructions. A clear understanding of the following is REQUIRED*. * Additional resources may be made available to the Moderators upon application acceptance. guide the community in acceptable behaviours and teach new players the game. Report any major bugs, harmful community trends or other emergencies directly to the Community Manager. Reports of any action taken while you are moderating. When you are playing the game, you are always a moderator. By becoming a moderator you sacrifice the option to play the game as only a player. Respond to player questions and explain why a player was silenced through private messaging. Report any inappropriate names or permanent bans that are needed to Support. Text in chat will appear as a different colour, to help regular players identify your answers. Contact support to request bans for players violating our Rules of Conduct for Chat. You will be a trusted part of the community, in contact with the community and development team. We are currently accepting applications for volunteer moderators for Egg Breaker Adventures on Facebook! If you would like to apply for a moderator position, please fill out this APPLICATION. NOTE: We generally receive a large volume of applications; you will only receive a response if you are selected for the next stage in the selection process. Do NOT send us multiple emails or forms if you have not received a response. Doing so will immediately nullify your application. Earn awesome bonuses by resetting monkeys! You can now earn Deja Vu Tokens by resetting monkeys. Spend these tokens on awesome bonuses! All Prizes for the selected monkey. All Gold and Area Tokens. 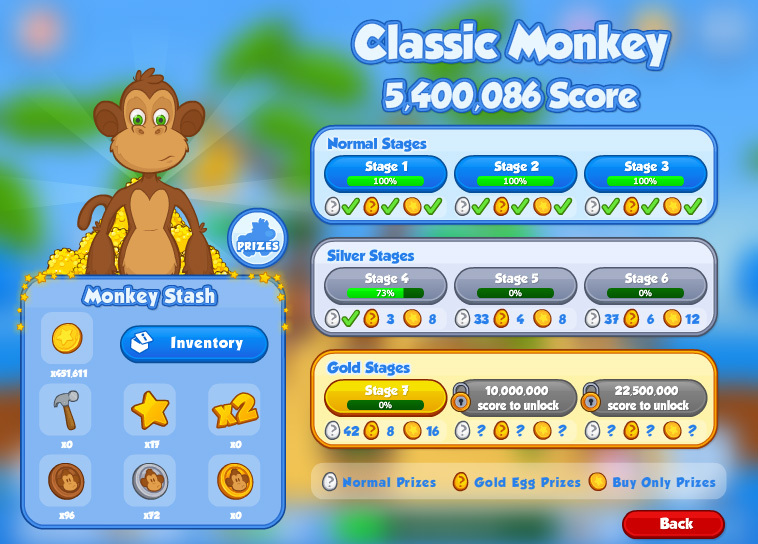 Extra banana hammers for the selected monkey earned by completing stages. All Monkey hammers above the value of hammers a reset leaves you with earned from a banana feed. The number of Deja Vu tokens you earn will be based on your score since your last reset. The higher score you have the more tokens you get! Since no score is lost, you can increase your current score in the rankings by having another chance to multiply all the prizes. More Area Token Wins Wins. The more resets you do, the more you can improve your Deja Vu bonuses. These Deja Vu Bonuses will apply to ALL monkeys! So get started with Deja Vu today and maximize those monkey scores! Special Weekend Bonus: Until November 2nd at Noon PST all Deja Vu Tokens earned from resetting monkeys will be doubled! 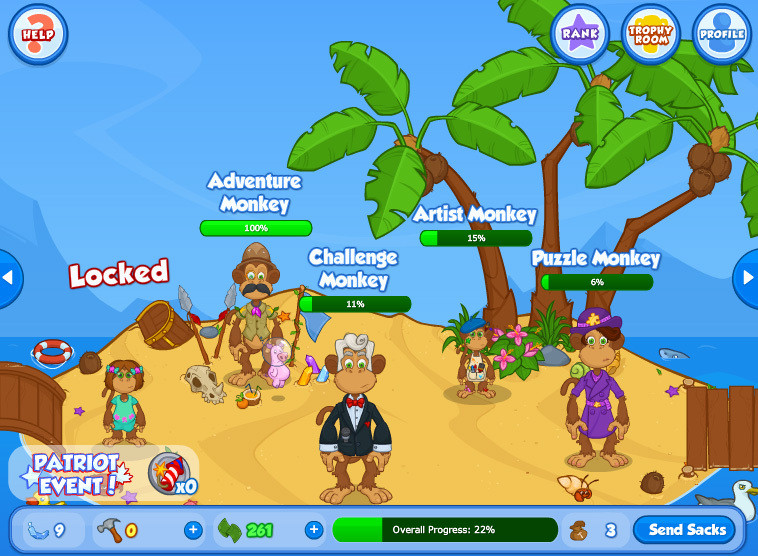 The Zombie monkey is back for some Hallowe'en mischief on the Egg Breaker Adventure Islands! Help him collect his food of choice, Candy! - Find Hallowe'en Candy in eggs in the Zombie Monkey's special stages to fill Candy bags to advance between the bronze, silver and gold levels. …12 Bags of Candy at the Gold stage, as well as having won all 12 prizes to earn the Hallowe'en Event Trophy!. If you merely activate the monkey, but do not feed him, the buff will not increase. You must feed the Zombie Monkey for the buff to increase. The permanent Base x2 buff only applies to Candy wins. The base multiplier will reset every day at Midnight Pacific Time. Zombie Monkey Challenge Eggs! For extra sweet bonuses, you can complete challenges in the Zombie monkey! Complete each one in order to unlock the next! You get a bonus Trophy Room item for completing 5 and 10 challenges! For finishing all 14, you get a trophy which gives you an extra 10 Hammers per banana! Visually watch the mountains of sugary goodness grow with each bag filled! Easily track your progress towards bags filled, Prizes collected (Click the Prize button to see which ones you've earned/are missing), Progression Ribbons and the Hallowe'en Trophy! Can be displayed in a Trophy Room. Highest Ribbon unlocked and the Hallowe'en Trophy (if earned) will be awarded after the event finishes on Wednesday November 4 at Noon PST. - Must be used by 11:59:59 PM PST on 2015-11-5! - Small chance your win is Doubled! The Hallowe'en Event will run until Wednesday November 4, @ Noon PST. Scare up the forums with feedback!! Glam Up for the Fashion Event! It's the most fashionable event of the season! Mr. Monkey has invited the Challenge Fairy to show off her skills at fashion design - and she'll rise to the challenge with your help! For the duration of the event, special challenge eggs will temporarily replace all normal challenge eggs, and the eggs will appear at a higher than usual rate. 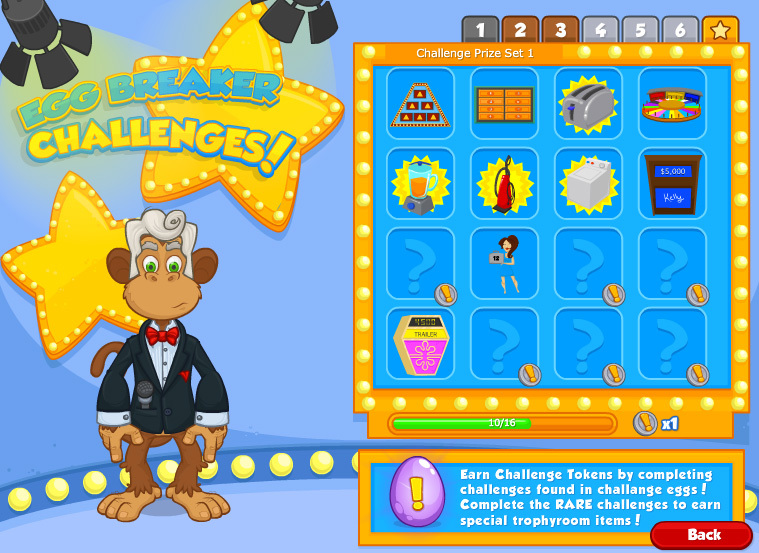 Players can earn 12 event prizes of various Fashion themed items from cashing in Event Tokens with the Challenge Fairy Monkey. The Handbag Hammer adds less Nothings! The Feathery Toque adds less Nothings! The Mannequin Head adds style to any trophy room! The event runs until Wednesday October 21st at Noon PDT! Oktoberfest has come to the Egg Breaker Adventures Islands! Celebrate all the fun and festivity with the Challenge Fairy's burst event! Yummy food, good drinks and new and interesting music to listen to, it's one exciting party! For the duration of the event, special challenge eggs will temporarily replace all normal challenge eggs, and the eggs will appear at a higher than usual rate. 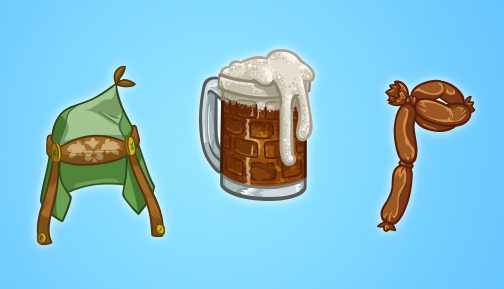 Players can earn 12 event prizes of various Oktoberfest themed items from cashing in Event Tokens with the Challenge Fairy Monkey. The Sausage Hammer adds more Stars! The Ledermutze Hat adds 10% more Stars! The Novelty Beer Mug adds fond memories to any trophy room! The event will run until Tuesday, October 13th at Noon PDT! Thwack! The ball is hit! It's going long! It's over the fence! Grand slam! Mister Monkey is a huge sports fan. 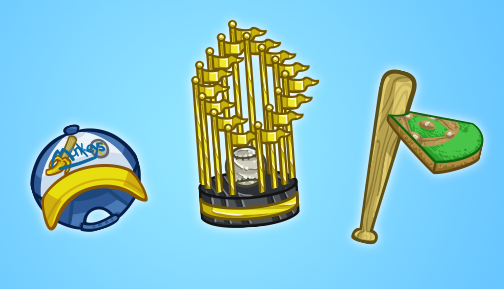 Get ready to celebrate the baseball playoff season with an all-new challenge event. The Challenge Fairy is back with a Baseball Champions event! For the duration of the event, special challenge eggs will temporarily replace all normal challenge eggs, and the eggs will appear at a higher than usual rate. Players can earn 12 event prizes of various Baseball themed items from cashing in Event Tokens with the Challenge Fairy Monkey. The Bat Hammer adds more Area Tokens! The Team Cap Hat adds 10% Less Nothings! The Championship Trophy adds winning flare to any trophy room! The event will run until Friday, October 9th at Noon PDT! 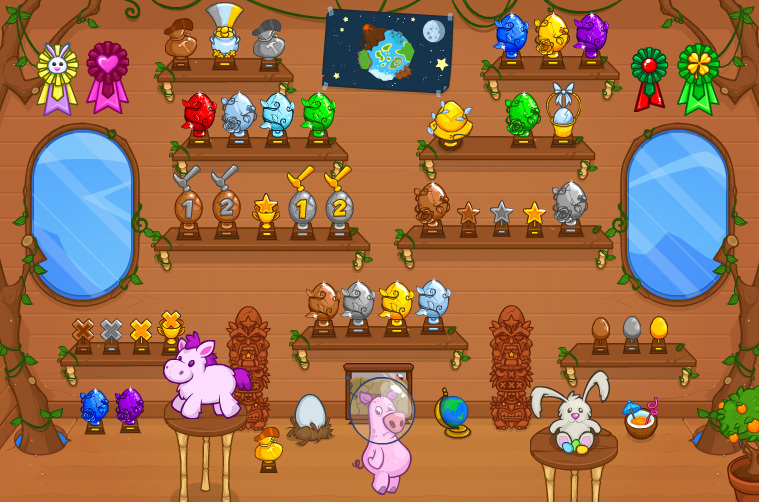 Autmnal Event in Egg Breaker Adventures! Fall has arrived in the Northern Hemisphere! The air is crisp, leaves are changing colours and the Challenge Fairy Monkey wants to celebrate the beginning of the harvest season with a celebration of an updated Autumn themed Mini Event! For the duration of the event, special challenge eggs will temporarily replace all normal challenge eggs, and the eggs will appear at a higher than usual rate. 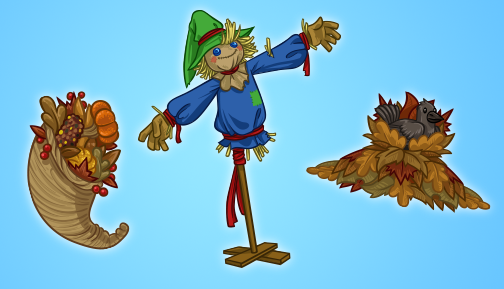 Players can earn 12 event prizes of various Autumn themed items from cashing in Event Tokens with the Challenge Fairy Monkey. 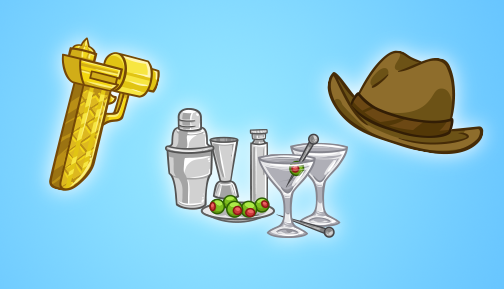 For the toughest of tough challenges, there are 3 new awesome prizes! 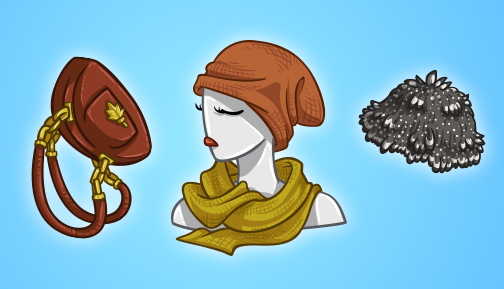 The Bird Nest Hat adds More Area tokens! 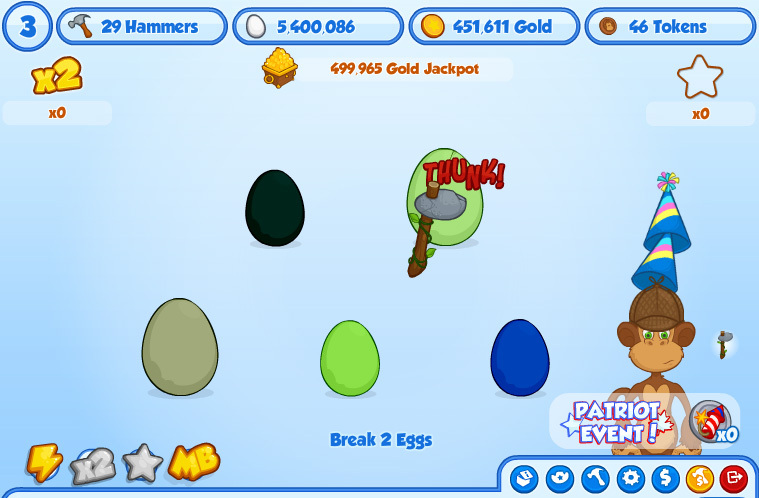 The Cornucopia Hammer adds Less Nothings! The Not So Scare Crow will defend any trophy room proudly! The event will run until Tuesday September 29th at Noon PDT! Play Egg Breaker Adventures Now!